The list was based on 22,000 reviews posted in the past year on Google, TripAdvisor and Yelp. Scores were tallied and combined to determine the level of travelers’ overall satisfaction. The scores were then ranked to create the 100 Best Fan-Favorites Destinations list. The “100 Best” will gain valuable exposure in MEDIAmerica publications Oregon Home, Oregon Business, as well as the Discover Portland in-room hotel guest guide. Winners may also promote their achievement with exclusive rights to use the “100 Best” logo on their promotional materials and at point-of-purchase. The top 100 destinations will be charted on a map for visitors and residents to use as a guide for traveling the state. A total of 75,000 statewide maps will be distributed in 2017 at most of the state’s entry points and visitor centers. Destinations wishing to sign up for consideration for the 2018 100 Best Fan-Favorite destinations survey may do so here. Participation is free. 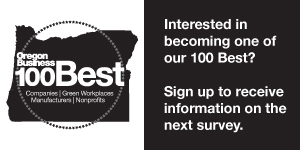 MEDIAmerica is the publisher of Oregon Business magazine and the well-known 100 Best Companies to Work for in Oregon survey. I think you forgot a very beautiful place in Central Oregon outside Bend is Smith Rock State Park. Gorgeous pinky/orange mountains at sunset!!! For the historic 2017 total solar eclipse , National Geographic filmed onsite the event and the geosphere structure constructed on the Ranch At The Canyons property in Terrebonne, Oregon. I live there and saw the whole process from my backyard! !